Last night, I put together ingredients for a nice loaf of bread—for today’s picnic lunch. It’s a slight modification of the wonderful Sullivan Street no-knead bread made popular by the New York Times. I reduced the recipe to two-thirds so that the bread would fit into my Pyrex glass covered pot. This is the recipe, adapted from the New York Times article. Combine flour, yeast, salt, and olives in a large bowl. Slowly add 1 cup water and stir until blended. Cover with plastic wrap and let rise for at least 12 hours at warm room temperature. This is best overnight or when started the morning before. When the dough is ready, place dough on a lightly floured board, sprinkle flour on top and fold it over on itself several times. Then, cover loosely with plastic wrap and let rest for 15 minutes. Using just enough flour to keep dough from sticking, gently shape dough into a ball. Coat a cotton towel with flour and put the dough, seam side down, on the towel. Dust with more flour. Cover with another towel and let rise for 2 hours. Dough is ready when it has more than doubled in size and will not readily spring back when poked with a finger. A half-hour before dough is ready, preheat the oven to 475 degrees. Place a large covered Pyrex pot in the oven as it heats. When the dough is ready, remove the pot from the oven. Turn dough over into the pot, seam side up, and replace the lid. Bake in the covered pot for 30 minutes, then remove lid and bake for another 30 minutes until perfectly browned. Cool on a rack. Danny, Beautiful loaf of artisinal bread. You are truly a polymath. Talents in all areas. There is magic in a great loaf of bread, some say religion is found in proper bread. Thanks for sharing. Thanks, Monte. I love this basic bread recipe. It’s so simple yet wonderful. 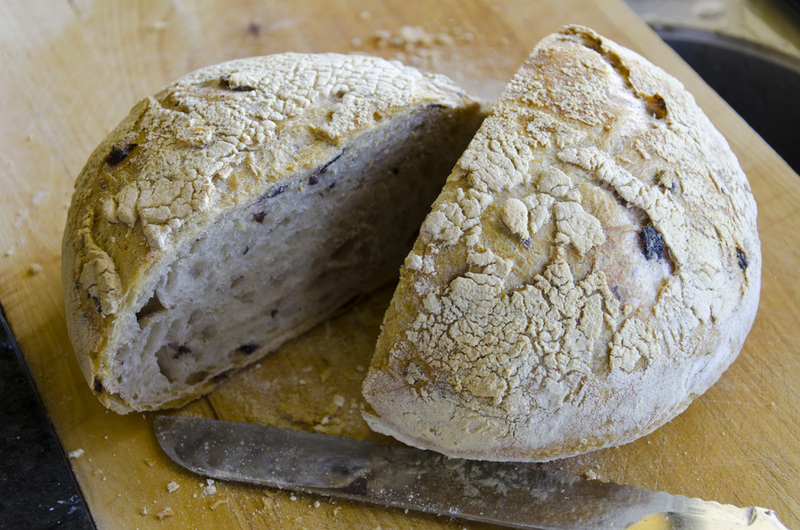 Chris Jobe shared the original recipe with me, and I think the olives add another dimension of complexity—a great loaf, especially with some assorted cheeses.